I once saw Pierre Koffmann bone out a pig’s trotter in under a minute. It was good to watch the master at work but you don’t have to be so accomplished to have a go. With a little practice and determination you should be able to manage it – just give yourself a good 10 minutes first time round. 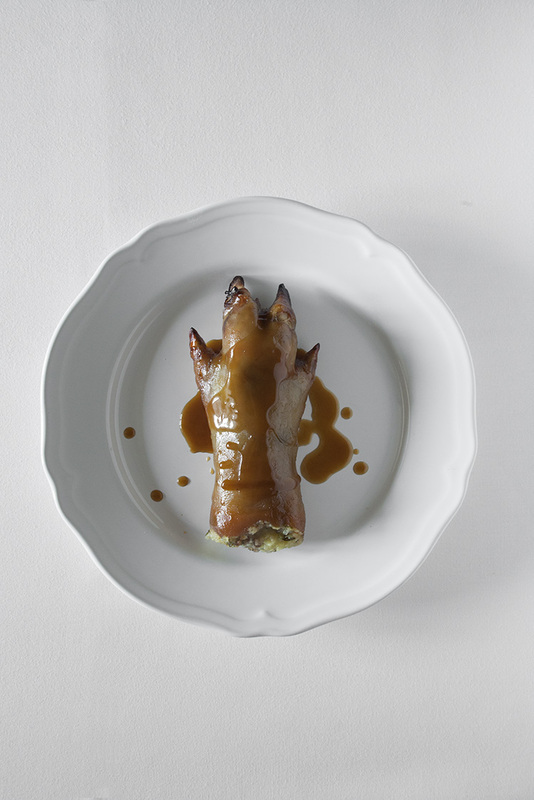 This is my version of the classic stuffed trotter dish made famous by chef Koffman. Place the trotters in a heavy casserole dish with the onion, carrots, wine, stock and thyme. Cover and cook in the oven for 21⁄2–3 hours. Meanwhile, for the stuffing, add the potatoes to a pan of salted water, bring to the boil and cook until tender. Soak the dried ceps in a bowl of warm water for 10–15 minutes, then drain, reserving the liquor. Once the potatoes are cooked, drain and then return them to the pan. Mash well with the butter and set aside. Place a frying pan over a medium heat and add a dash of oil, followed by the bacon or pancetta. Cook for 5–6 minutes or until just starting to colour. Add the onion and ceps and continue to cook, tossing regularly, until the onion is soft and the bacon is crisping slightly. Season with salt and pepper and add the chopped parsley. Add the bacon and cep mixture to the mashed potato and combine thoroughly. Leave to cool, then chill. Lift the trotters out of the casserole on to a board. Strain and reserve the cooking liquor, discarding the vegetables and herbs. To prepare the trotters for stuffing, open out the tender skin that surrounded the bone you removed. Divide the potato and cep mixture into 4 portions and fill each trotter, carefully encasing the stuffing as you go. Wrap each stuffed trotter tightly in foil and refrigerate until set. When ready to eat, preheat the oven to 200°C/Gas mark 6. Place the stuffed trotters in a roasting tray with 2 glasses of water and warm through in the hot oven for 20–25 minutes. Skim off any fat from the reserved trotter cooking liquor, then combine with the cep soaking liquor. Pour into a pan, bring to the boil and boil steadily until reduced by two-thirds. Season with salt and pepper to taste. Carefully remove the foil from each stuffed trotter and place on warmed plates. Spoon over the sauce and serve with buttered Savoy cabbage.